The 1870-era estate settlement for Michael Trautvetter mentioned all his siblings and some nieces and nephews. 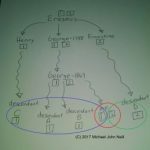 Estate settlements of relatives (particularly siblings of ancestors) who died with no living descendants can contain significant genealogical clues. The distribution of assets may mention siblings of the deceased, nieces, nephews, and other relatives–depending upon the family structure. The records may provide relationship details and information on where the heirs lived. Estate settlements of relatives who were only children and who died with no descendants can be even more informative as the relationships of the heirs will be more distant. Review your files–do you have a relative whose estate settlement could name missing family members? People who “leave” tend to “reappear” when money is involved. Genealogy Tip of the Day is sponsored by GenealogyBank. Check out their current offer for new subscribers. I’ve wondered about that. Helpful information Thank u. Very good point! 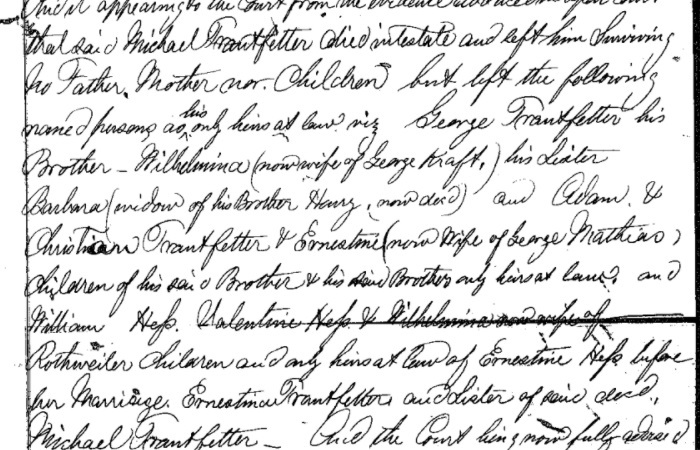 ALSO you may want to check wills of a cousin of your ancestor if they did not have children. EXAMPLE: My mother had a 1st cousin that was married, but no children. I, my siblings and other 2nd cousins (and one 2nd cousin once removed) were mentioned in his will because all of his 1st cousins (including our mother) were deceased.